Ada pertanyaan untuk Int Place? Dirancang untuk wisata bisnis dan plesiran, Int Place terletak strategis di Thonburi, salah satu daerah lokal paling terkenal. Hanya 41.1 km dari sini, hotel bintang 2 ini dapat secara mudah diakses dari bandara. Dengan lokasinya yang strategis, hotel ini menawarkan akses mudah ke destinasi yang wajib dikunjungi di kota ini. Int Place menawarkan pelayanan sempurna dan segala fasilitas penting untuk memanjakan para wisatawan. Sejumlah pilihan fasilitas kelas atas seperti WiFi gratis di semua kamar, binatu (laundromat), Wi-fi di tempat umum, tempat parkir mobil, lift dapat dinikmati di hotel ini. Int Place memiliki 79 kamar tidur yang semuanya dirancang dengan citarasa tinggi. Banyak diantaranya memberikan kenyamanan seperti televisi layar datar, akses internet WiFi (gratis), AC, meja tulis, akses internet kabel LAN (gratis). Disamping itu, hotel memiliki berbagai pilihan fasilitas rekreasi yang menjamin Anda melakukan bermacam hal selama menginap. Ketika Anda mencari penginapan yang nyaman di Bangkok, jadikanlah Int Place rumah Anda ketika Anda berlibur. Properti mewajibkan uang jaminan sebesar THB 1000 pada saat check-in. Resepsionis buka mulai 06:00 AM hingga 12:00 PM. Para tamu yang datang di luar jam tersebut diminta untuk menghubungi pihak properti secara langsung sebelum kedatangan, sehingga pengaturan alternatif akan dilakukan. Tamu yang datang setelah pukul 12:00 PM akan dikenakan biaya tambahan. This hotel is convenient if you have a car or motorcycle. It is away from all the touristy areas, on a busy road, but its rooms are situated at the rear of the property and therefore very quiet. Close to Rama 2. 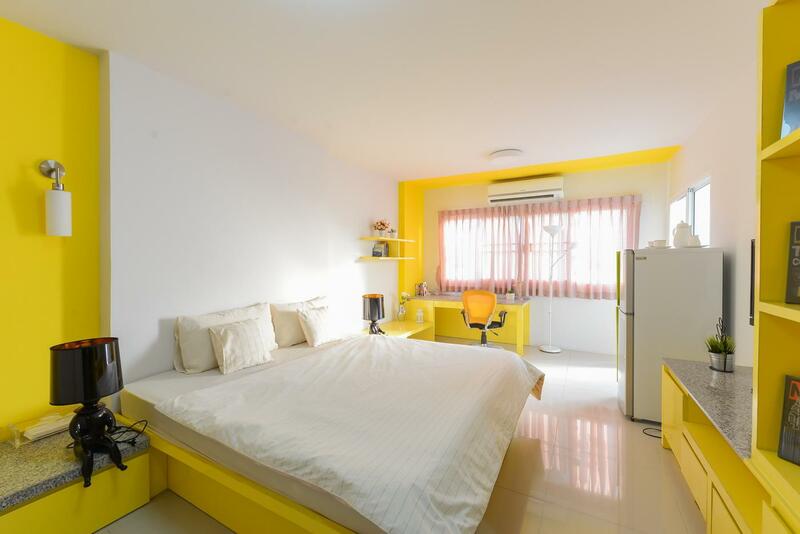 Big room, comfortable and suitable for a couple. refrigerator and tv provided. I have a problem with bathroom due to a not good function of a shower. Near to attraction place. Would repeat to be here after this. One more important thing, grab is available anytime! Don't use grab taxi! Staff was the star of this property. The room is spacious. But not very clean. Hairs and stains on bed sheets. I expect better for 20 bucks. Bathroom shower was weak. Pls rectify it if possible for maximum enjoyment of shower. I booked this property for 5 nights, my flight was cancelled so I called the property to informed them, had to call several time until somebody answered my call and struggled a lot to communicate. They told me they will call me back next morning with a good English speaking member of staff, and never did. I tried to call back without getting anybody to answer my calls. I travel a lot but this is the first time that I struggle to talk to somebody in a hotel or resort sold by Agoda. Finally I just booked another room next door and lost my payment at Int Place. Very very dirty. I not recommend this hotel. I got mold in the toilet. bed sheet and cover duvet very old. I decided move to other hotel same day. Nice clean hotel, friendly staff, would benefit from tea and coffee making facilities in the rooms. I would stay here again. Thank you very much for your valuable comment. We will improve our services and hope to see you again. I have been informed that smoking is prohibited in room but can smoke at balcony in which hotel provided ashtray but make sure no smell go inside room. When I checked out I was informed that there is smell in room and I will be charged 500 baht from deposit because they said smoking was not allowed. I have gone up to room again and mentioned that hotel should try to clean and spray it before informed guest with no solution at all. I didn't agree and ask to to clean if such smell still there I will pay, during that one of staff or maybe owner talk to me with I assumed it is the worst hospitality I ever met and just insist to charged me. By the way, after 45 minutes they told me to go to see room again and the smell was distinguished but that staff still blamed me that after spray smell gone the smoking smell will come again and hotel cannot sell for 4-5days. I insist that now no more smell and they just throw my deposit back to me with the terrible manner. This is a terrible service!! Pro: AC, big fridge, spacious room, balcony, lift, cheap. Con: Dirty sheets, noisy construction site nearby, staff speaks little English, really bad wifi. Good for one night if you need to be in the area. Very bad. I was on a business trip and internet did not work on the day I arrived. The staff was very impolite. The room was full of mosquitoes when I arrived. One of their electric plug exploded when I tried to plug my computer. I strongly do not recommend this hotel. It is good value for money. Good room size and AC working well. The reception is very kind and helpful. It would be better clearance, particularly for shower. Room could be cleaner. Front Desk was helpful. Carpark available for drivers. Toilet is clean but shower is weak. Pls do something about that. Room is huge so that's a plus. Inexpensive, but not much more. It is ok for the price but you cannot check out early because they are not 24 hour staff. Pros: clean, tidy spacious rooms, good value for money. Cons: away from most tourist attractions. This hotel is really great for the value, rooms are big and very comfortable.... the staff is always very friendly and accomodating.